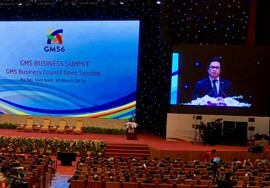 The first-ever Greater Mekong Subregion (GMS) Business Summit opened in Hanoi on March 30 as part of the sixth GMS Summit (GMS-6) and the 10th Cambodia-Laos-Vietnam Development Triangle Summit (CLV-10). Vietnam Business Forum would like to present the full text of the opening remarks delivered at the event by Dr Vu Tien Loc, Chairman & President, Vietnam Chamber of Commerce and Industry (VCCI). “On the same river” – the legendary Mekong – our fate is shared. Six countries - China, Laos, Cambodia, Myanmar, Thailand and Vietnam – are located along the Mekong, generations after generations. We are proud to be born here, in fertile lands, diverse in culture, rich in potential, connected to major economies, namely ASEAN, China and India. With great efforts by member countries, supported by international organizations, many cooperation programs within the Greater Mekong Sub-region (GMS) are being implemented. A GMS supply chains are being expanded. It’s been a quarter of a century since the launch of the GMS Economic Cooperation Program, supported by the Asia Development Bank (ADB). During this time, we have witnessed greater reform and development achievements in the GMS countries. The most important achievement, in my opinion, is the rapid process of industrialization which is taking place, together with successes in poverty reduction and the booming of the GMS private sector. The GMS Business Council (GMS-BC) plays a pioneering role in this development process. This is a mechanism aiming to connect the regional business community. It is also a partner in the public-private partnership for the development of GMS in which national chambers of commerce and industry play the onwership roles. Today in this GMS Business Summit, held for the first time, we discuss business outlook and new economic drivers. We will also discuss and decide the private sector development action plan 2018. I sincerely thank all of you, ministers, global and regional business leaders for your participation in this summit. We agree that despite of many achievements, GMS remains in the catchment area of lower level development in comparison with ASEAN, Asia and the world, in GDP per capita, infrastructure, technology, finance and quality of human resources etc. Facing the new requirements of development, opportunities and challenges are enormous for the GMS. With significant geo-economic, geo-politics, abundant natural and human resources, an ever-deepending and broad reform and integration due to the industrial revolution 4.0., we have comparative advantages in agriculture and tourism. We can become “the kitchen of the world”. We can also become a new manufacturing hub of the world, due to inexpensive labour and young population. The biggest challenge of the GMS economies is institutional quality and business competitiveness in order to meet the international standards and to connect to the global supply and demand chains. The GMS economic drivers in the coming years will be entrepreneurship, micro, small and medium enterprises, and women-led enterprises. We will discuss all of these issues in the summit. We welcome heads of governments, ministers to particpate in the dialogue with the business community. We also welcome the initiative by Cambodia to establish the GMS Young Entrepreneurs’ Network. We, Vietnam Chamber of Commerce and Industry, would like to take this opportunity to propose the establishment of the GMS Women Entrepreneurs’ Network, and the GMS Start-up Network. I hope that these entrepreneurs’ networks will multiply GMS’ efforts in integration and development, together with various initiatives and programs to promote regional connectivity, facilitate trade and investment, training, protect the environment, and foster sustainable development. We would also like to propose further consideration to implement the connectivity program through super-highway cables, abolishment of mobile phone roaming fees, and establishment of an association to address cyber-security challenges among the GMS countries. If implemented, these initiatives could create a platform to allow GMS countries to leap-frog in the industrial revolution 4.0. This will help increase competitiveness of the GMS economies. As an example, Viettel Corporation, from Vietnam, will have a presentation on these initiatives during a panel discussion of the summit. With the spirit of “the same river” in sharing and cooperating among GMS countries, I would like to declare open the GMS Business Summit 2018.